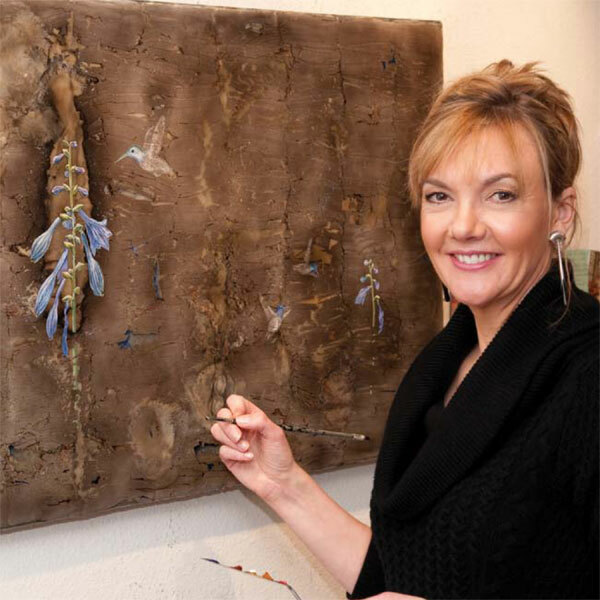 What brings Susan Russell Hall’s work to life beyond it’s apparent beauty is the artist herself. She weaves stories of how nature reflects the patterns of our lives; time spent gazing at her work and hearing her stories inspires the viewer and moves the spirit. Susan’s resume indicates that her first solo show was in 1977 at the University of Washington’s Women’s Cultural Center. However, her mom will attest that her first show was at age five when paintings hung along their fence in the front yard. Pieces sold for five cents to a quarter, and she will tell you it sold out. Her work can now be found at the Gordon Woodside/Brash Gallery in Seattle. To view this artist’s work, visit www.susanrussellhall.com. What makes your art process unique? The encaustic process is an ancient technique devised by Greek artists in the 5th century B.C. It is accomplished by laboriously applying multiple layers of wax, pigment, and heat. Numerous hours are spent in the preparations of the panel prior to any painting of an image. I have basically had two separate careers: one as an encaustic artist and one as a medical illustrator. It was a great honor this year to be selected as one of 40 artists to have work included in Encaustic Works 2009, the seventh International Encaustics Biennial in New York. After working as a medical illustrator for 18 years, my husband, Dale, and I moved to Tacoma to help start the Pediatric Cardiac Surgery Program in 1998 at Mary Bridge Children’s Hospital. Since then, I have documented over 6500 different surgeries on individual patients. What do you hope the viewer gains from the experience of your work? A place of reflection. If quiet contemplation can take place then usually the answers will come to our questions. Often we just need to be allowed the time. To slow down is a human need we need to honor. I try to approach challenges with determination, hard work and a sense of humor. I approach each day with a decision to make it a good one to keep on moving forward and progressing in my work. Intense times of loss and grief are part of life. However my artwork has always been a way of processing and working through difficult times. It is amazing to look back and see what has played out in my paintings. After seeing one of our patients long after his surgery, he showed me a tattoo of a heart on his leg. This heart was not of the Valentine sort, but the picture of his actual heart I had drawn during his surgery when he was a young boy. As an adult he now has a young son of his own. What is your favorite thing to do beyond your art? My number one thing to do is be with my friends and family. Beyond that, I love running and working out daily, as well as going for hikes and exploring. I also love traveling and good food. Nature has always been an integral part of my painting, but instead of painting “from” nature I try to paint through nature. My goal is to capture the delicate balance and connections of all things. Why is creativity important in your process? Isn’t the process all about creativity? Just problem solving through the process creativity becomes a natural part of it. I don’t know how you’d move ahead if you didn’t have that creative process.